While this might sound tempting, it’s also tax season and the perfect time to obtain a comprehensive tax depreciation schedule that ensures you maximise the deductions you can claim from an investment property. One of the reasons investors often miss out on deductions at tax time is because they don’t seek expert advice. Quantity Surveyors are recognised under Tax Ruling 97/25 as one of a few professionals with the knowledge necessary to estimate construction costs for depreciation purposes. To demonstrate some of the items which heat up the deductions you can claim from an investment property, let’s take a look at an example of the depreciation claims available in the first financial year in the following graphic. There are two types of claims available in any income producing property as demonstrated by the graphic above; capital works deductions and plant and equipment depreciation*. Capital works deductions apply to structural and fixed items within a residential property; for example the kitchen cupboards, walls, doors, drawers and shelving. Structural items will depreciate at a rate of 2.5 per cent per year over forty years so long as construction commenced after the 15th of September 1987. Any of the easily removable plant and equipment assets found during a site inspection of a property may also entitle the owner to claim depreciation deductions. Examples of plant and equipment assets as demonstrated above include the refrigerator, the range hood, furniture, light fittings, floating timber floors, the gas heater and ducted gas floor heating. 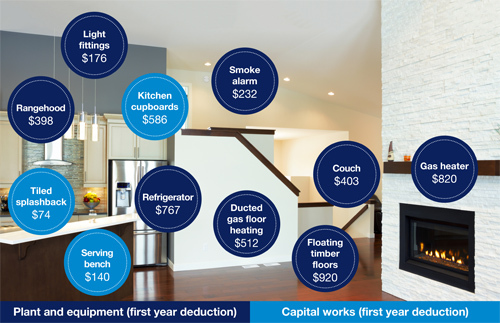 In the above example, an investor could claim $398 in first year deductions for the range hood, $767 for the refrigerator, $176 for the light fittings, $820 for the gas heater and $512 for ducted gas floor heating. The smoke alarm, which costs less than $300 will entitle the owner to an immediate write-off for this item, meaning they can deduct its full value in the first financial year and claim $232 in deductions. *Under proposed changes to legislation, investors who exchange contracts on a second hand residential property after 7:30pm on 9th May 2017 will no longer be able to claim depreciation on plant and equipment assets. 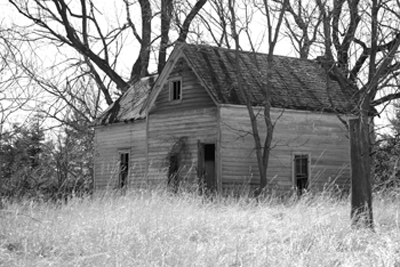 Investors who purchase a new property will be able to continue to claim these items as they were previously. We are currently speaking with government to further understand the intricacies relating to the proposed changes. To learn more visit www.bmtqs.com.au/budget-2017.